Roland Lee Paige was one of the homeless people who came to the broadcast site of this year's Homelessness Marathon. I don't know a lot about him. He came alone. He was 48 years old. And he died during the night. Roland Lee Paige, doubled over and dying from what, apparently, was a methadone overdose. The people around him, including the photographer who snapped this picture, thought he was just falling asleep. I tried and tried to write a memorial message that said something moving about how Roland's death teaches us all about how dangerous it is to be homeless. But I could never finish one of those messages, because, I can't really say for certain to what extent Roland's death even was related to homelessness. The truth is that the biggest impact Roland's death had on me, personally, was that it scared me. The whole fifth marathon was scary, because so many of the homeless people who spoke out were angry. Maybe that was because another year had passed without any hint of a solution. Or maybe it was because Portland, Oregon is a city where homeless people feel they're treated badly. Roland's death just completed a very chilling picture. I didn't need Roland's death to give me sympathy for homeless people. I already had that. What Roland really gave me was sympathy for all the people in houses who don't want to know, because knowing hurts. I guess it's kind of a backwards gift, but I can only hope we gave him anything as valuable in the brief time he was with us. Two days ago, Rolland Lee Page died under the wings of the T-Horse. I didn't know Rolland - indeed, nobody there seemed to know him. We'd set up the T-Horse for an overnight event on Tuesday around 4:00pm. Rolland appeared shortly thereafter; I didn't even see him walk up. At some point I turned around and there was a man in a red jacket sitting cross-legged on the carpet near the rear of the truck, bent over with his head down on his ankles. After an hour or so, people began to wonder if he was ok. It seemed like he was breathing, perhaps just sleeping or passed out. Someone who knelt down to check on him said he smelled of alcohol. Someone said it was probably best just to let him sleep it off. Time went by. At one point, while walking around to the truck kitchen I accidentally tripped over his knee, forgetting he was there. I touched his shoulder briefly and mumbled, "oh! I'm sorry..."
After about six hours a few people asked if he was really breathing. Others, who'd been keeping an eye on him, said they were pretty sure he was, and he was probably just still sleeping - best to just let him be, it wasn't all that uncommon. Someone touched his back and said he was warm. Someone else said she thought he might be dead, it's been so long. Someone answered, half-seriously, well, if he is there's not much we can do about it, and we'll find out eventually. Time kept going by; you don't really notice the hours at an event like this. I had in my mind that he'd been there for a long time, but it didn't occur to me just how long it had been - nearly 12 hours. Someone decided to try to wake him up. He knelt down next to Rolland and rocked him a bit. He lifted him up a little and shined a small flashlight. I could see a small pool of blood and a yellowish substance on his jeans where his face had been resting. His hair was very ragged, his face was pale and his hands were curled up. The man opened Rolland's eyes and shined the light into them. He told a friend to call 911. When the paramedics arrived, one walked over, lifted up his arm, looked at his face and said simply, "He's dead." Sounds heartless, doesn't it? I mean, probably over forty people had come and gone at the T-Horse in all that time. How is it that nobody thought to check up on this poor brother who'd been sitting there, motionless, for so long? I didn't mention that Rolland was homeless; that this T-Horse was at the national Homelessness Marathon radio broadcast (www.homelessnessmarathon.org) outside, in the cold, in the street, in front of KBOO Community Radio; that the vast majority of people there at the event were homeless, some with varying degrees of mental illness, many with nowhere else warmer or safer to go than SE 8th Avenue at Burnside in the middle of the night. Does it change the story that Rolland was homeless, and sat motionless and died unnoticed at a gathering of homeless people? We're so used to seeing men and women curled up and motionless on the street -- if they look homeless. We think about them for a minute or so while walking away, and soon forget about them. The homeless are said to be the invisible people. 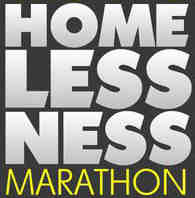 The host for the Homelessness Marathon goes by the name, "Nobody". Some homeless guy, some nobody, died on the street. About two weeks ago, B. died in his apartment here in Portland. He took his own life. A lot of people in our community knew B. He worked at the People's Farmers Market sometimes, and I'd often see him in the Co-op. Always friendly, always interested in having a conversation, connecting with other people. B. suffered from clinical depression, and, like many clinically depressed people, struggled with feeling dependent on anti-depression medication. When someone you know - even someone you didn't know very closely - commits suicide, you wonder if there was anything you could have done that would have saved him or her. What if you had just taken an extra 30 seconds last time, asked how s/he was doing? Was there something you didn't do, or say, and should have? One of the Great Lies of our society is the myth of the individual - the cowboy, the high-powered single career mom, the young American adult fresh out of school living alone in the big city and building a life for her/himself. Contrast this with what a Danish friend once said to me about poverty and homelessness: "Well, in Scandinavia we think of each other as a sort of extended family. Everyone's your sister or brother, in a way - and you wouldn't let your sister or brother go hungry, or be homeless on the street." When I spent some time later in The Netherlands, which is more ethnically diverse, I realized it isn't just common heritage that keeps poverty and homelessness minimal in Europe -- it is, even more so, mutual respect for each other's dignity and humanity. Treating each other as the extended family that we are. I kept telling myself on Wednesday that we did what we could -- we sort of kept an eye on the guy, we acted from experience. I told myself after B. 's suicide that I didn't really know him anyway, I couldn't really have made a difference. That's wrong, I know now. If I've learned anything from my years with City Repair and the T-Horse, it's that small interactions between people can be incredibly powerful. Think about a stranger's comment that once colored your whole day. Think about a chance interaction that influenced how you think, or perhaps even changed the course of your life. If I had treated Rolland or B. like I would have treated my brother -- paid a little more attention a bit sooner, spent a little more time to talk with him -- maybe things would be different. The "myth of the individual" IS a lie. In reality we are not independent of each other. Unless you are living in uncharted wilderness somewhere - far away from supermarkets, zoning codes and email - you are part of a community that, quite literally, keeps you alive. We are "each others' keepers", as is implied in Genesis. We need to look out for each other. * Compassion and love - the greatest virtues - demand this. Demand it! Need a reason to love strangers in our selfish, individualist society? How about this: We are all reflections of each other. Or, as some friends say, I am another You. This isn't metaphysical coffee talk. At a basic level, it's the recognition that I could be in your shoes, or her shoes, and vice versa. When Dignity Village came before the Portland City Council last year, Commissioner Francesconi upheld individual empowerment as a better solution when he said, "I'll never be homeless... I've got money." The thousands upon thousands of homeless people who never thought _they'd_ be homeless know that's an illusion. So take care of each other, look out for each other, as individuals. Be a community, and that includes the people you don't know. We live in a sick society. * More so "sick" as in 'unwell' or 'ill', but also "sick" as in 'abhorrent' or 'disturbing'. I call our society 'ill' because there are limits to our collective compassion. Individually we may each give money to charity, give a blanket to a homeless person, buy a hungry person a meal... But collectively we have basically decided that we are not ultimately "our brothers' (and sisters') keepers". How healthy can our society be if we still let others live and die in the gutters? And I call our society 'disturbing' because people are dying in the street, PEOPLE ARE DYING IN THE STREET ! in front of us, every day... and we, as a society, focus our attention instead on maintaining national economic growth, or spreading our military and economic influence to every corner of the Earth, or quibbling over the domestic political issue of the day. We do next to nothing about it, we practically deny it. So do what you can to create a society of justice. Vote. Demand affordable housing and universal health care. Demand that the richest society on earth take responsibility for the people it breaks and throws away - and demand that it reform. If we can spend $400+ billion to make the deadliest military arsenal in the world even deadlier, we can eradicate poverty and homelessness. Rolland was drawn to the community and warmth of the T-Horse when he sat down for the last time. As individuals, we were all concerned for him. But as a community, we failed him on that night. As a society, we failed him months, perhaps years ago. Shortly afterwards, a friend remarked that Rolland might be looking down and thinking, "what a beautiful place to die, surrounded by warmth and people." How horrible - how insane - is it that Rolland is actually one of the lucky ones? To die at a community event - and not behind a bush, or in a snowy doorway, or in a subway tunnel. What could I have done? What can you do next time?